Bozonzo is from an uncharted dimension of which little is known. He has proclaimed himself the clown god of terror. He has crossed over into our dimension on several occasions throughout history. His first travel to Earth occurred during Egypt’s Fifth Dynasty during the rule of Pharaoh Dadkeri-Assi. Bozonzo was defeated by a group of magicians assembled by the Pharaoh. In response to the threat of Bozonzo’s return the Pharaoh hired a clown court jester. His thinking was that if they had their own clown to mock the image of Bozonzo he could not instill fear in them in return. Clowns have existed to this day because of this. 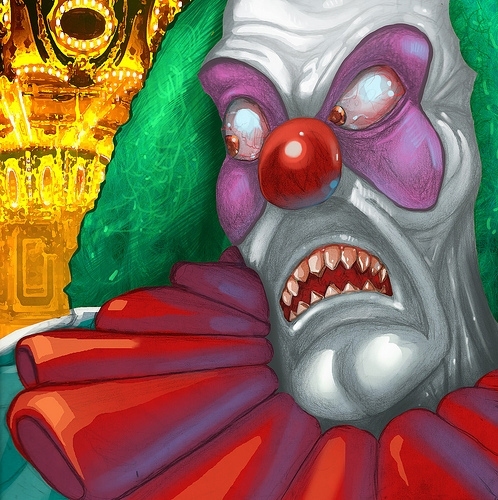 There are some evil clowns that worship Bozonzo and on occasion he is able to possess them from his own dimension. Most recently Bozonzo crossed over into New Edmonton City and caused the city to go into a state of frenzied fear. He was defeated by the Misfits. Although it was mainly Demonman who did all the fighting.